NORWICH, UNITED KINGDOM --(Marketwired - June 08, 2016) - SessionCam, a leading provider of technology which helps businesses optimize their websites by tracking exactly how users behave on each page, has published a white paper which suggests that businesses which take fewer calls from their customers will increase customer loyalty, enhance staff morale and save money. 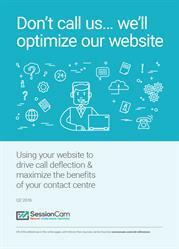 The white paper, entitled Don't Call Us… We'll optimize our website, provides an evidence-based challenge to contact centers that rely primarily on the telephone. It also contains opinions and perspectives from businesses including, Endsleigh Insurance and Gocompare.com. According to SessionCam, today's customers prefer not to pick up the phone when they have a problem or a question. For example, 72% of online consumers in the US prefer to use a website to find answers -- but 75% are forced to turn to another channel, like the phone, when a website lets them down. Self-service is increasingly the way forward, with 35% of British consumers saying they prefer to avoid human contact. The telephone's place in business is changing and so, therefore, is the call center. Phone calls from frustrated customers aren't enjoyable for contact center staff, either, and reducing the number of inbound calls can help a business to increase its profitability and grow its brand reputation in a number of ways. Customers are now much more fluid about the methods they choose for solving problems, and expect businesses to meet their demands by offering a multi-channel or omni-channel approach. Customers will decide, on the fly, which communication channel they want to use, according to the nature of their query, the time of day, their current activity, their location and their context. Yet many businesses only offer one or two ways to contact them, which is frustrating for 62% of consumers. 1. Optimize its website content, functionality and user experience, so that customers don't become frustrated and feel obligated to reach for the phone. 2. Identify precisely where to add additional communication channels to the website (such as live chat and intuitive help), so that customers can access instant help without resorting to the phone. According to Phil Reay, Head of Insights at SessionCam: "Customers just don't like using the telephone the way they used to. Since websites are now their first port of call, websites must really perform for them. Technical problems, missing content, poor design and a bad user experience will cause customers to bail out of the conversion channel, and that's where SessionCam comes in. "We can show a business what to do in order to make that sale or engage the customer in other ways, turning frustration into loyalty," says Phil. "By doing this, companies can redeploy contact center staff to more expert, less monotonous roles which focus on problem-solving, relationship-building and delivering greater value for customers." 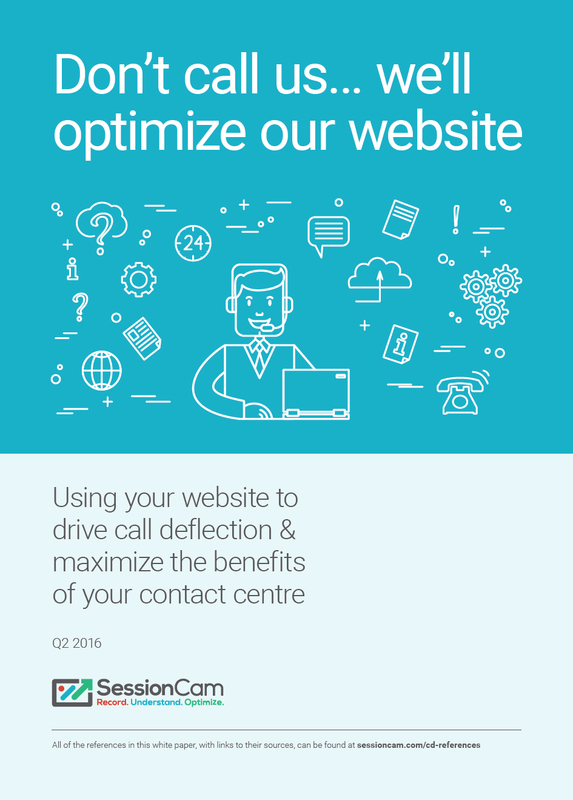 The white paper Don't Call Us… We'll optimize our website can be downloaded for free from SessionCam's website at http://info.sessioncam.com/call-deflection-whitepaper. SessionCam provides customer experience analytics software to some of the world's top brands. Our advanced session replay, heat-mapping and conversion funnel technology enables our clients to optimise their online user experience and significantly increase conversion rates. Founded in 2009 and based in the United Kingdom, SessionCam is leading a new generation of customer experience analytics tools that apply machine-learning to identify conversion issues at key moments of truth. Learn more at https://sessioncam.com, and follow us on facebook.com/sessioncam and Twitter @sessioncam. About this company SessionCam Ltd.